The cannabis industry is breaking new ground... and making investors a lot of money. Each month, more and more U.S. states are legalizing cannabis for both recreational and medical purposes. After last year's mid-term elections, Michigan became the 10th state to legalize recreational marijuana. And so far, medical marijuana is legal in 33 states and Washington, D.C. According to Grand View Research, medical and recreational cannabis sales are projected to skyrocket to more than $146 billion by the end of 2025. It may eventually surpass both the soda and tobacco industries... This industry is still in its infancy, with a lot of room left to run. Importantly, major blue-chip companies seem to agree. And it's one reason we could be entering the early stages of a marijuana boom this year. Over the past several months, we've seen massive deals to consolidate the industry. As of February 2019, these companies had a combined market cap of nearly $300 billion. These successful, sophisticated organizations are expert allocators of capital... They see opportunity for investment gains. Thomas was one of the most respected and longest-serving health care analysts on Wall Street before he joined us at Stansberry Research. Lately, he's got his eye on the potential boom in cannabis stocks – for good reason. These partnerships show the successful, sophisticated blue chips believe a boom is coming. They're staking real money on it. The benefits for the blue chips are certainly attractive. For example, cigarette giant Altria's deal helps diversify the company away from cigarettes – which more Americans are shunning – and toward a high-growth product like marijuana. And while Molson and Constellation don't face Altria's growth challenges in their core businesses yet, they're heading off the problem now by striking deals with their potential competitors (as well as locking in new avenues for growth). They've decided to get ahead of the shift, rather than lose sales to the upstarts. So today, while you shouldn't fall for the hype in certain cannabis investments... that doesn't mean you should avoid this up-and-coming sector. This could be the year we see the cannabis industry begin to boom in earnest... and the worthy cannabis companies start to rise to the top. Editor's note: This emerging industry has incredible speculative potential... but it can also be volatile. That's why Thomas Carroll is hosting a special online event on Wednesday, March 27. He'll share everything you need to know – plus, he'll give away the name and ticker symbol of a cannabis stock he believes could soar 500% in the next few years. Click here for more details. "This idea is responsible for some of the greatest investment fortunes in history," Doc says. It's simple, but it isn't easy. And it is particularly important when investing in up-and-coming, volatile sectors like the cannabis industry... Learn more right here. "If you're thinking about getting on board an exciting, speculative opportunity... then you need to read this," Doc writes. "It could make the difference between a life of incredible wealth, or crushing debt." Read more here: Exactly What to Do With Your Money Today. Mastercard (MA) is a $237 billion payment-processing giant. In 2017, it accounted for 21% of all credit- and debit-card transactions in the U.S. The company collects a small transaction fee every time you swipe one of its cards. So as people spend more, Mastercard will bring in more revenues. 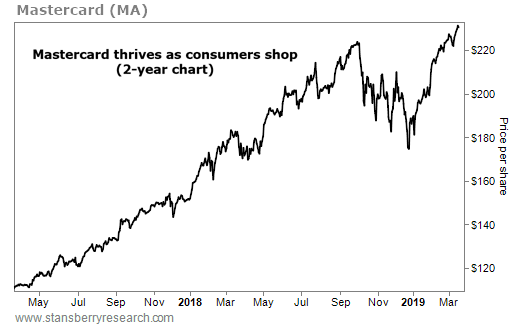 And today, folks are busy shopping… Mastercard reported record revenue of $15 billion in 2018, up 20% from the year before.